Major challenges to modelling economic, energy and emissions systems are the need to cover a time horizon over several decades and to deal with significant changes with respect to upcoming breakthrough technologies, disruptive events, social innovations and structural changes. Both issues require a new generation of models that aim at a more deepened structural analysis on the one hand and an explicit representation of the relevant stocks on the other. The longer time horizon is motivated by the implications of investments that are made today but determine flows and environmental impacts over their whole lifetime, in some cases (e.g. buildings) over several decades. These deliberations motivate a deepened structural framework for a more comprehensive understanding of economic activities. The Figure visualizes the central aspects and their interactions. Three distinctive categories are of importance. First, the notion of functionalities as purpose of any economic activity. Second, the emphasis on the role of the stock of resources (not only reproducible and human resources, but also renewable and exhaustible resources) for the flow of reproducible (goods and services). Third, the interactions of the stocks of resources and the flow of reproducibles for providing functionalities. Fourth, the direct relevance of stocks for functionalities. Fifth, the environmental impact of economic activity on the extended stock of resources. One major aspect of the deepened structural modelling approach is the emphasis on the proposition that functionalities result from the interaction of flows from reproducibles and stocks of an extended list of resources. The concept of functionalities in a deepened structural model is made operational along three tiers that are relevant for the sources and the composition of Austrian emissions: the physical, the economic and the institutional tier. Each functionality affects the three tiers and is also affected by them. 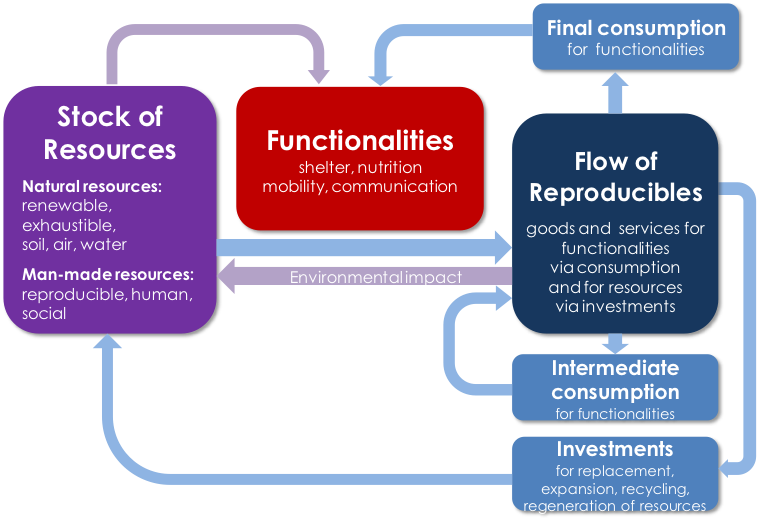 This underlying mindset (functionalities) and basic structure (three tiers) for modelling builds the basis for analyzing transition processes that drive the emissions and the economic system. One of the main challenges of implementing and developing a deepened structural modelling are additional data requirements.